Graphene boasts a number of exceptional properties, but arguably its best feature may be its form as a strong and flexible sheet of material. After all, the ancient art of origami teaches us that an infinite range of shapes can be created by folding up paper-like sheets like graphene. 3D is the new 2D: folding techniques may be employed for bottom-up fabrication of intricate 3D nanostructures or for assembling flat-packed devices that can unfold where or when needed. A square twist mechanical switch: recently shown possible due to hidden degrees of freedom. From Nature Materials 14, 389–393 (2015) “Origami structures with a critical transition to bistability arising from hidden degrees of freedom”. Origami-led concepts have already inspired the design of numerous soft devices made from 2D polymer sheets such as miniature robots that self-assemble and become mobile by folding and unfolding. Recently, mechanical metamaterials were constructed, using a paper folding technique called snapology, that can smoothly change shape from a flat sheet to a voluminous block of material, and back. In recent years, the bug of origami-inspired design has also caught among graphene researchers as the possibilities seem endless. Controlled crumpling and folding of graphene can produce new types of 3D nanostructures of interest for flexible electrodes in batteries and supercapacitors. In another strand of research, scientists have unleashed the power of kirigami – origami with cutting – to make super-stretchable, ultrathin graphene electrodes that could be used in biomedical applications. In a more classic origami demonstration, graphene oxide paper sheets can self-fold into boxes that could be used as miniature containers that open and close on demand. Proposals also exist for folding single layer graphene into thin but robust nanocages for high-density molecular storage. 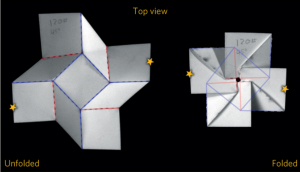 Astoundingly, new discoveries are still made in origami research as the mechanics of folding materials yields new surprises and previously unknown geometries (see figure). Graphene researchers may want to pay attention as the inspiration for the next breakthrough in graphene materials may be found in novel geometries enabled by the art of paper folding.